The Neilly House is located mid-block on the north side at 51 John Street West. 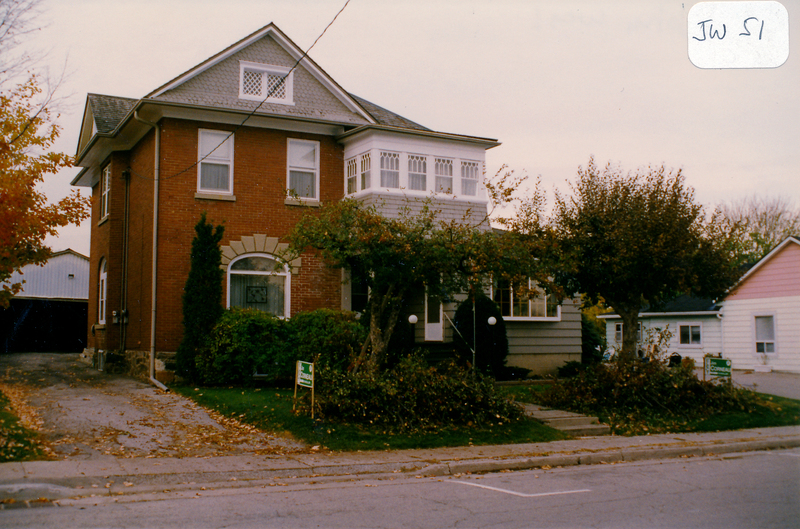 It was built around 1900 in the Eclectic Edwardian style. The structure was designed by the same architect who was responsible for designing Bradford’s Anglican Church. This house was built for jeweler Andy Neilly. His business was on Holland St. (across from the Queen’s Hotel). He was a good hunter and sportsman and belonged to the Neilly Rifle Club. The club members met at Eagle Hill on the 13th Line (at the canal on the end of Back and Bingham Streets). This building was later the home of Mac Tobias and his wife. They ran a clothing store on Holland St. (in the second building east of the Queen’s Hotel) before moving to Toronto after World War II. Dr. McMichael, a dentist, lived and had his office here until he moved to Barry’s Bay. Merle and Shirley Woodcock and their family eventually bought, repaired, and remodeled the house. Please contact the Bradford West Gwillimbury Public Library (905-775-3328) if you have any other information about this photo.